Spiral staircases are often ideal for homeowners who want a staircase in a tight, narrow or confined space. In most cases, these stairs will circle as they go up, often centered around a central pole. The costs of a spiral staircase on its own only, without any professional installation, will greatly depend upon the basic framework, the material it uses, the size/diameter and the company you use. Technically, a spiral staircase could cost as little as $600, but it could also cost as much as $50,000+ if you were to use an experienced craftsman and have him or her handcraft a staircase by hand. However, for most spiral staircases for a residential setting, you should be prepared to spend anywhere from $1,000 to $10,000+ for a pre-fabricated setup. As there are so many factors, which will get into later, the range of costs can be so wide because of this. As for the spiral staircase installation costs, these costs will greatly depend on the setup of your installation. Does the contractor need to remove older stairs? Are you buying a pre-fabricated kit and they need to put it together? Other factors can include the size of the steps to be installed, where you live, the contractor you hire and if any complexity presents itself. The average contractor, from the quotes we researched online and received from our users, were anywhere from $800 to $1,800 for just the labor. Since every job can be unique, as you can see, we recommend you try to get as many free quotes as you can via HomeAdvisor.com. Here, you can simply describe your project and locally licensed contractors will contact you with estimates as to what they may charge you for the job. The service is free and no credit card is required. NOTE: Some companies may include all of the options above as a base package, so be sure to ask about what's included. Spiral-Staircases.com, for example, offers an in-depth list of the costs of their pre-fabricated steel-based spiral staircases. Just for the base, which measures eight and half feet, from floor to floor, will come in a standard black color and will range anywhere from $680 to $2,135, depending on the diameter. Of course, this is just the price for the base only and will not include the additional features you need to comply with the local building code. This could include the code-size treads ($200-$735 per stair, depending on diameter and material), handrail options ($50-$1,000+), center baluster options ($15-$19+ per step) and any additional options if required. The all-wood option, however, includes the basic framework, including the base poll, the oak balusters, non-code oak treads and the handrails with up to 10 treads and 11 rises for code stairs. Pre-fabricated kits at Lowe’s, for instance, range anywhere from $1,800 to $3,500, but again, it will not include the professional installation. Another online retailer, Fontanotshop.com, also offers a variety of spiral staircases ranging https://us.fontanotshop.com/staircases/spiral-staircases.htmlfrom $1,500 to $3,200. From the looks of it, both of these kits come straight out the box and will be assembled similarly to that of a furniture kit. How large? First, you have to understand that the size and the level of the customization you require will greatly affect the price of your spiral staircase. If you wanted the smallest sized spiral staircase, which is often a pinch more than three feet at about three and a half feet, then you’re looking at the lower price range mentioned above. However, if you wanted a larger-than-average diameter, say, six feet wide and you wanted it made of a premium material such as a carbon steel, then the costs could be more than $20,000. Now, the same can be said about the height since a three-story home will cost less than just a simple two-story home. As you can imagine, the more height you need, the more material you need, hence, the higher costs. Raw materials: In most cases, a spiral staircase will either be made of a steel, iron or wooden frame. Adding a powder coating finish, while optional, can also add to the costs, but homeowners often find this as a perk as it will help protect the stair as it’s designed a barrier of sorts to protect the finish from weather and heavy foot traffic. Railings: Most pre-fabricated staircases, as indicated in the link above, will come with railings, but all retailers and packages are different. If you needed railings for your stairs, then like the materials the stairs are made of, the same can be said about the railings, with wood being the most common, followed by a metal-like material. Treads: The treads, which are the steps you will walk on as you go up to the spiral staircase, can add to the base cost, and the prices will depend on the diameter and the material it’s made of. Like the base of the staircase, the wider the stairs are, the more you’re going to pay, with prices ranging from $200 to $600 on average. Features: Spiral staircases can offer a variety of special features such as extra balusters, spindles and/or risers that can close off an open space on each step. While some may be required by local code, some homeowners opt to add it for aesthetic purposes. The more features and customizations you want to add to your spiral staircase, the more you can expect to pay. Demo: If old stairs exist, plan on spending another $500 to $1,500+, depending on the complexity and setup of the old stairs. From most of the retailers we looked at, the most common types we found included steel, wood, forged iron, galvanized steel and an aluminum powder coated. Classic steel, often noted as the best sellers for most retailers is the most cost-effective option as it is extremely flexible when it comes to the designing process. Buyers are able to often customize the spindles, the handrails and can be as custom as you want it to be. For wood stairs, it can be costlier, especially if you were to choose a higher-grade wood. Wood spiral stairs, often custom-built, will be made of a solid wood and can be customized just like the steel option. Iron stairs, known for its ornate details, can really pop out due to its decorative balusters that are able to create complimentary patterns. Galvanized steel, another cost-effective option, can last more than 100 years, even with no maintenance. Often used outside, the galvanizing process will offer your stairs a weatherproofing options that’s able to provide your stairs with an indestructible coating where corrosion often occurs. In the end, the galvanized steel creates a metallic silver finish, similar that of a battleship; however, it can be painted, usually six to 12 months after the process was complete. Aluminum powder coated stairs, just like the galvanized steel option, is great for an outdoor space. 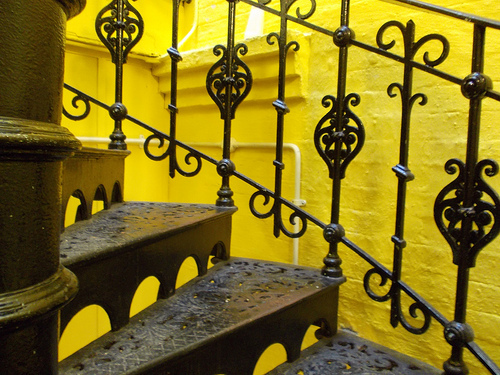 Coated with a powder coated finish, this process offers a free finish, allowing the stair to last. Coming in a variety of customized colors, these stairs can match quite well with an outdoor deck. Before you get excited about your purchase, it’s important to know your local building code as all cities in the United States will vary with code. Some may say you need to have a certain amount of spindles per step, while other cities may say your railing has to be so long. In some cases, certain sizes may need a resting platform, all of which can add to the total costs. To know for certain, talk with your local planning board to see what you will be responsible for to ensure your stairs are up to code. If your staircase is going to be used to access an area to your home, then it will have to meet building code without any exceptions, regardless of where you live. The same can be said if you wanted to add this staircase to a deck in your backyard, for instance.